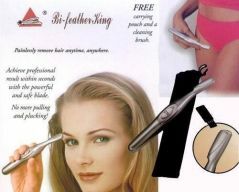 The Bi-Feather King is a portable, lightweight and discrete personal hygenic hair trimming set which operates using a powerful electric motor and safe trimmer blade, to help you trim faster and easier, achieving perfect results in seconds. The Bi-Feather King is a very handy, lightweight personal trimmer, which allows you to use it at home or carry it easily in your handbag. * Amazing Eyebrow trimmer and shaper for Painless Hair Removal. * Erase your unwanted hair with this professional Bi-feather king razor kit. Achieve perfect result within seconds with the powerful and safe blade.